The 84th Academy Awards will be awarded on February 26, and there is a surprising campaign surging within the film industry to nominate an actor that has been overlooked heretofore. The circumstances surrounding this omission are most unusual, and they are fueling the movement to get him nominated now. The slighted actor is named Uggie, and he is a dog. Specifically, Uggie is a Jack Russell Terrier, and in The Artist he plays “Jack,” a comedic side-kick to a Hollywood matinee idol named George Valentin during the silent movie era. The Artist has been widely praised by critics and audiences, and has been nominated for ten Academy Awards, including Best Picture. Further, Uggie’s co-star, Jean Dujardin, has been nominated for Best Actor. In essence, The Artist is a movie-within-a-movie, and Uggie reprises his “silent movie role” with Valentin in The Artist. The scenes with Uggie are utterly delightful, and some critics declare that he steals every scene. The opening scene at the breakfast table during a marital dispute between Valentin and his wife is priceless, and thoroughly reveals the comedic talents of both Uggie and Mr. Dujardin, a noted French comedian. However, The Artist is not a comedy, and wise movie-goers will bring a tissue or two. 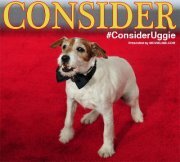 The campaign to nominate Uggie for an Oscar is gaining stream on Facebook, with a page named “Consider Uggie” and the effort is championed by S.T. Van Airsdale, an editor at Movieline. Currently, Uggie has 11,538 “likes,” on his Facebook page, which also says that he has won top prize at the Golden Collar awards in the United Kingdom, which recognise canine excellence in films. Uggie, as seen on his Facebook page. In addition, Uggie has already won the Palm Dog Award at the 2011 Cannes Film Festival. Nominating a dog for the Academy Awards is not without precedent as Rin Tin Tin reportedly gained the most votes for Best Actor in the first Academy Awards in 1929, although actor Emil Jannings was actually presented with the Oscar for his two films, The Way of All Flesh and The Last Command. The actor champions the move to install a special Oscar for animals in film. Mr. Cromwell is a seasoned hand, and in The Artist he plays the charming role of Clayton, Valentin’s man-servant, and deserves his own nomination for supporting actor. Wikipedia further claims that The Daily Telegraph has endorsed the campaign, believing that a win for Uggie at the Oscars would be a win for all canine film stars, such as Terry, the Cairn Terrier who portrayed Toto in the The Wizard of Oz. As for The Artist, it is a strange movie, or rather it is a straightforward movie that produced very strange feelings within me. I saw it Saturday at the Grand Cinema in Tacoma. It is a French movie about a Hollywood film star, Valentin, during the silent movie era, and the movie is mostly silent! As such, it does a superb job of transporting you back to that era, yet, I found the silence sometimes left me wanting for more. I yearned for sound to add more punch to the movie. Nevertheless, many of the scenes worked quite well, and as the film progressed I learned to appreciate the power of silent movies. Most exquisite is the scene of Valentin burning his old movies during a dark night of the soul as “talkies” take over Hollywood. However, Uggie’s true story is equally compelling, as Wikipedia reveals. Uggie was so wild a puppy that he overwhelmed the homes of two owners and ended up at a dog pound in Los Angeles. There, he was destined to be euthanized until a dog trainer in the film industry named Omar Von Muller, took a chance on him. Now, Uggie lives with the trainer and his family, which includes six other dogs – all of whom work in movies, commercials and TV. According to Wikipedia, Uggie was born 2002 and has starred in six films. Besides The Artist, Uggie is famous for his roles in Mr. Fix It and Water for Elephants. Uggie started his career with a touring dog talent show, and appeared in commercials before launching his movie career. This entry was posted in Culture, Entertainment, Events. Bookmark the permalink. Isn’t Uggie’s story sweet? I have to believe that Uggie will be honored somehow during the telecast next week. I have to find somebody who is having an Academy Awards party!